•The bookings can be modified with no additional cost prior 15 days before the date of check in. The modifications will be subject of the availability for the requested dates. • The cancelled bookings with no cost prior 15 days the date of check in will be elegible for the "only breakfast" program, meanwhile the check in will not have cost in the "all included" program if the cancellation is done 20 days prior the date of the check in. • The cancellations out of the indicated dates are subject to the charge of the 50% of the booking. • En caso de no show se cobrará el 100% del valor total de la reserva. In case of no show, the booking will be charged totally, the 100% of the total price of the booking. • From children between 1 year and 4 year, they are exempted of paying. • Maximum one child per room, sharing the bedroom with the parents. • For more than one child, it will be necessary to pay an additional bed for the "only breakfast" program. The price will be 50 USD or 35 USD plus VAT fee. Atacama Adventure Ecolodge is based on exclusivity and pleasure. The stay we offer is based on the sense of exclusivity. We received a Atacameña house built of natural materials such as adobe, rustic wood, stone river, bamboo, etc. The house offers a continuity with the experience in excursions, with memories of the local culture. 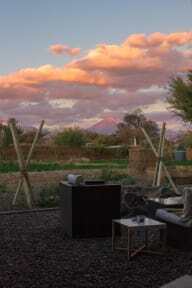 Our purpose is to live with the Atacama culture and nature, in a home atmosphere. Each part of the house is separate to ensure privacy and absolute rest. 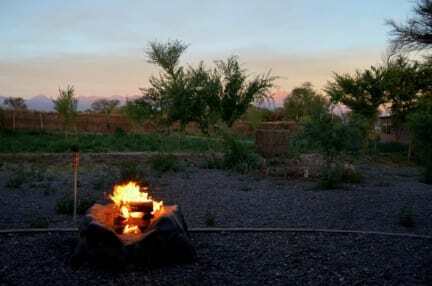 Atacama Adventure Ecolodge is 1.5 km from the center of town of San Pedro de Atacama, in quiet location and view of the volcanoes of the Andes, surrounded by silence and native trees as the Chañar and Algarrobo. We are near as well from Reserva Nacional Los Flamencos and Laguna Cejar, both of them great natural attractions that will delight the travellers. Our accommodation lodge offers the following rooms: Double Superior. Comfortable double room with super king bed or twin beds at your choice, spacious private bathroom with hot water, jacuzzi and breakfast included; Double Standard. Comfortable double room with super king bed or twin beds at your choice spacious private bathroom with hot water and breakfast included. Triple Standard. Comfortable triple room with super king bed and a single bed or three single beds of your choice , with private bathroom with hot water and breakfast included. Single Standard. Comfortable single room with single bed , with private bathroom with hot water and breakfast included. Chilean travellers must pay the tax fee. Foreign travellers can be exempted for such fee if they have with them travelling document.